Loretta's recent post on the elaborately patterned wallpaper in the 1809 Hedge House reminded me of the even more elaborate wallpaper of the 18th century. I've written here about the eye-popping replica wallpaper used in some of Colonial Williamsburg's houses. But today I'm offering painted proof of just how busy all that pattern could become in the Conversation Piece, above, by Philip Hussey (1713-1783), c. 1760. Conversation pieces were a distinct sub-genre of British painting popular in the Georgian era. I think of them as "action portraits", featuring several individuals interacting with one another in a room, landscape, or even on a barge on the Thames. Often conversation pieces feature several generations of a family, but they can include friends, servants, and favorite dogs and horses, too. Portraits can reveal much about the sitter's wealth and rank through dress, but the setting of a conversation piece can show far more, often including the sitter's country house in the background, or perhaps clues to a special pastime enjoyed by the sitter, like astronomy, music, art collecting, or hunting. Sometimes, however, the setting seems to overwhelm the sitters. There's little doubt that the parents in the painting above are proud of their young children, but clearly they wanted their elegantly appointed parlor highlighted, too. I can't find these sitters' identity (if anyone else recognizes them, please let me know! Update: Possibly members of the Corbally family from Rathbeale Co Dublin, Ireland - see the comment below. ), but I'm guessing they were prosperous members of the rising middle class. This painting is full of pride of ownership. 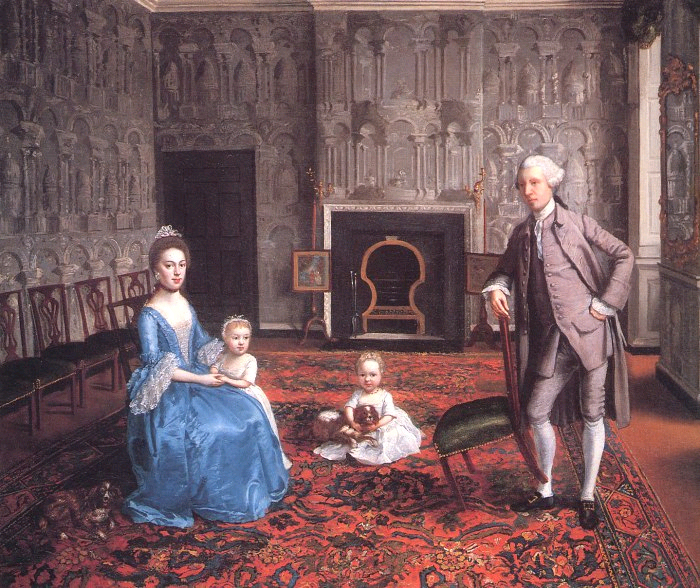 In addition to their fashionable clothing, rich with silk and lace, the sitters have a full set of stylish mahogany chairs, upholstered in black leather; a room-size patterned carpet (very grand in an era where most floors were still bare); a pair of painted or needlework fire screens; and gilded candlesticks by the fireplace. But what most viewers notice first is the wallpaper. Wallpaper inspired by classical architecture was the height of fashion in the mid-18th c. Not only did it show the owners' taste and appreciation for the architecture of both classical ruins and the grand country houses of the nobility, but it also gave a sense of grandeur and detail to a room lacking its own architectural distinction. The wallpaper was also in itself a display of wealth. Wallpaper was costly, and printed with hand-carved wood blocks. The cost rose with the complexity of the design and colors, and the size of the repeat of the pattern likely made the wallpaper in this room very expensive indeed – which is why it's not covered with any paintings or mirrors. It's supposed to wow on its own, and it does. Above: Conversation Piece, possibly of members of the Corbally Family, by Philip Hussey, c. 1760. National Gallery of Ireland. Interesting conversation piece! Thank you for showing us! But in my opinion the man leaning on a chair on two chairlegs is most peculiar. Is he symbolising the vanity of al this wealth? Fascinating ~ there's actually a mirror on the wall on the right I noticed when I enlarged it. Very subtle - you would expect it over the mantel. I definitely don't think he's worried about the vanity of his wealth - the point of including so much here is to show it off. He's proud of his family and his house, and he wants you know it. LadyLindaJane, I hadn't seen that looking glass on the wall until you pointed it out! Sharp eyes, considering how hidden it is against the wallpaper. Took me a while to spot the second dog, too. Philip Hussey family portrait dating from c 1770 possibly Corbally family from Rathbeale co Dublin Ireland. Though this is uncertain. Is in the collection of national gallery of Ireland as far as i recall. Philip Hussey was a prominent Irish portraitist at the time,though not one of the most important. His studio was in Dublin. Government of Ireland research scholar. What I notice first is how starkly under furnished the room appears to the modern eye. I have a hard time keeping this in mind when I’m writing. My mental landscape always includes wingchairs flanking the fireplace and settees in the middle of the room. Thanks for your answer Ladies! I'm sure that in the 18thC every Dutch Calvinist seeing this extreme wealthy interior had to remind the book of Job! The man who lost suddenly all his properties. On the other side it's possible that the man of the house is showing his attention for wife and children, but also his shortage of time. Undoubtedly he's a very busy and hard-working man. He can stay for only a few moments and has taken a chair from the wall. But it's a unexplicable fact that a man with so much responsibilities is leaning on a chair on 2 in stead of 4 chairlegs! A wobbly equilibrium! Fascinating painting! Thanks for sharing it with us! Wonderfully unsettling papers! Rather than classical, it reminds me of multi-planed Jacobean or Mannerist architecture. Something like the English Mannerist portrait of Henry Howard, Earl of Surrey. Or those interior porches which feature in 17th century Dutch domestic paintings. Since Corballys rented Rathbeale Hall from 1805, and purchased it in 1832, it seems unlikely that this portrait is of them.